Mabel Victoria Day, Emily Rebecca Morris and Alice Henwood Earl were, respectively, the mother, maternal grandmother and paternal grandmother of George Aldis, the author of this monograph. All three were either born in London or spent much of their lives there, Mabel and Emily almost wholly so, Alice until she retired with her husband Ernest Aldis to the Swaythling Estate in Hampshire. 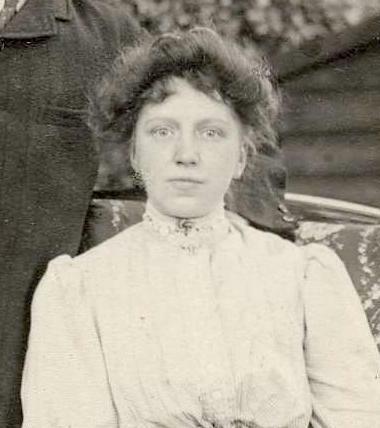 Alice Henwood Earl was born 22 November 1871 at 30 Crawford Street, Marylebone St. Mary, Middlesex, the daughter of Frances Caroline Earl, a kitchen maid. No 30 Crawford Street, where Alice was born, has now been demolished, and only a few of the original houses are left - replaced by ugly 1960's houses, flats and shops. It is clear from the beautiful plasterwork over the windows of the remaining houses that this was once a street of some quality. West Firle is a pretty Sussex village on the South Downs not far from Eastdean. It has a grand house, Firle Place in Firle Park - where doubtless many of the local people, perhaps Caroline amongst them, found employment. The church, where her parents William and Caroline, Alice's great-grandparents, were married, is impressive. Travelling between Eastdean and West Firle she and her parents would have seen the enigmatic figure of the Long Man at Willington - cut into the chalk - stark against the green of the downs. Frances registered the birth 13 December 1871, and the father’s name was not recorded. On her marriage certificate, however, Alice names her father as Joseph Henwood Earl, butler, indicating that Frances knew the identity of Alice’s father which she preserved in her daughter’s middle name. (It is not unusual, of course, for fathers’ names on marriage certificates to be inventions, to avoid embarrassment at the ceremony, and illegitimate children were often given the father’s surname as a second given name; so it is quite possible, though not certain, that Alice’s natural father was Joseph Henwood or Henward.) Nothing is known about him, and little attempt has been made to try to find out anything about him, since Alice was adopted at an early age into a family which appears to have given her a stable and loving upbringing. It may be worth noting, nevertheless, that a search of the area around Crawford Street in the 1871 census threw up a John Walter Henwood, a 22-year old footman at 28 Portman Square, who could have been Alice’s father despite the first name discrepancy (Alice could simply have misremembered the name, or John Henwood used a false name to avoid identification.) He turns up in the 1881 census as a drapery warehouseman, living in Hackney with a wife and two young daughters. By 1901 he was a widowed house steward in Hackney. The 1871 census on Marylebone, which includes 30 Crawford Street, was taken on April the 2nd before Frances Caroline took up lodgings there. Occupied by no less than 26 people, the house appears to have been a refuge for young women in trouble. The principal occupants were William Hearn, 39, who suffered from “rheumatics”, and his wife Augusta who ran a boot and shoe business. Their household comprised ten “servants out of employ”, all female aged between 17 and 23, two of whom had babies. Additionally, there were four other family groups. The pretty flint church at Eastdean - red tiled, low and reflecting the shape of local barns. The font in Eastdean church where Frances would have been christened - as were her mother and grandfather. A street in Eastdean with the pretty flint cottage near the village green. Precisely where Frances Caroline was at the time of the 1871 census is not known or, for that matter, where she was at census time in 1861. The illegitimate daughter of Caroline Earl, Frances was born 20 May 1845 in Eastdean, East Sussex, the birth being registered by her mother 28 June 1845 in the Eastbourne Registration District. No mention is made on the birth certificate of Frances’s father or at her baptism on 28 September 1845 in the parish church of Eastdean by the Minister Dr. Giles. By the time of the 1851 census Frances, aged 5, is living with her uncle William and his wife Naomi in Kingston, near Lewes, because her mother Caroline had died in 1845 when her daughter was only 2 years old. From her earliest years, therefore, Frances was raised by her family. “ James 14 ag. lab. Caroline, aged 16, has not been found in the 1841 census on Sussex, and it is assumed that she was in service, possibly in London, where she met the man who became Frances’s father. By 1861 Caroline is dead and her daughter Frances, herself also 16, is about to repeat her mother’s history of going into service, either locally or in London, and becoming pregnant.